You can smell them half a block away. Their scent is nearly as intoxicating as the flavor itself. Authentic Belgian waffles – made by Belgians (half the thrill, right?) – are now available on Robson Street. Find them at a sliver of a restaurant called Nero Belgian Waffle Bar. What it lacks in size, it makes up for in character and quality of product. Husband and wife team Jan and Eilnaz explained that their savory Parisienne Brussels waffle isn’t exactly traditional. In their country, you’d find people eating similar toppings on a baguette. Visually, the creation’s ‘wow effect’ is in full force. 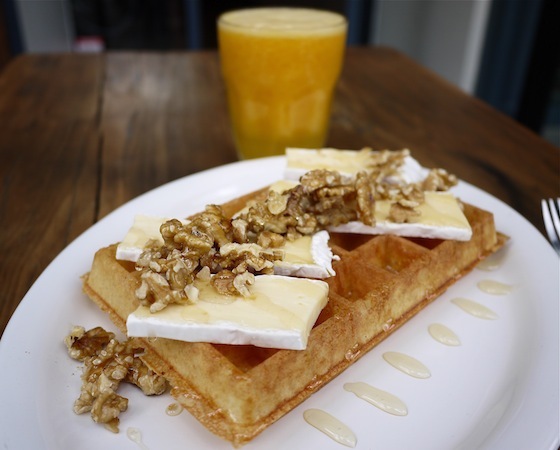 A generous handful of walnuts are dumped on a light and crispy Brussels waffle strewn with four thick slices of sumptuous Brie cheese and drizzled with honey. I couldn’t imagine anything possibly tasting better than this. An authentic Belgian savory option is the Queen, topped with homemade chicken mushroom stew. And of course a sweet and chewy Liege waffle (perhaps drizzled with white chocolate?) is an absolute must.